Glebe was originally inhabited by the Cadigal clan which occupied a territory that embraced Sydney Cove and stretched along the southern side of Port Jackson from South Head to about Petersham. As Sydney Town expanded, Glebe’s aboriginal population dwindled and no evidence of the Cadigal’s presence is found in modern Glebe. The places and people of the relatively more recent Glebe are inextricably linked and this is reflected in its distinctive character. In the early struggling years of the first settlement at Sydney Cove (1788), Governor Phillip first surveyed, in 1790, the penal colony at Sydney town and made a grant of 400 acres of land to the Church of England, in the person of the Rev. Richard Johnson, Chaplain to the First Fleet. This land became known as ‘The Glebe’ (or St Phillips Glebe) from the Latin word glaeba (a clod of earth) and, through its ecclesiastical use, signified church land. From the 1830s onwards, people such as the stern philanthropist, George Allen and his famous son, Sir George Wigram Allen, forged our local history. Other notable figures included Dr. James Bowman and some of the most famous colonial architects, Edmund Blacket, John Verge and James Barnet. Click here to read about some of the notable people in Glebe’s history. Financial difficulty forced the church to sell some of its land by 1856 and a two strata society began to develop: the homes of the gentry were built on Glebe Point while many workers lived at The Glebe. Gradually the big estates on the point were subdivided and the professional and middle income groups changed The Glebe from a quiet peninsula into a fashionable suburb. During the early 20th century and especially during the Depression years, The Glebe deteriorated and became shabby and overcrowded. Despite this decline, the area retained a close and distinctive community. Many of the lovely houses that were an important part of The Glebe were demolished — this destruction led to the formation in 1969 of The Glebe Society, which sought (and still seeks) to restore and retain what is left of the suburb’s historical past. 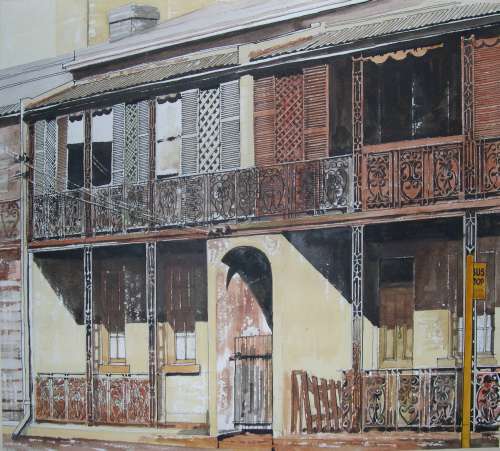 “Glebe” painted by Bob Phillips in Glebe in the late 1970’s or 1980.
well before 21st century renovators set to work. Because of its proximity to the city, the harbour and the University of Sydney, there has been a considerable revival of interest in the area. Click here to read more about fascinating episodes in Glebe’s social history.